Antananarivo (Agenzia Fides) - Strong position taken by the Catholic Church for the death of Fr. Nicolas Ratodisoa, victim of a brutal attack on 9 February and died on 14 February due to his injuries. His Exc. Mgr. 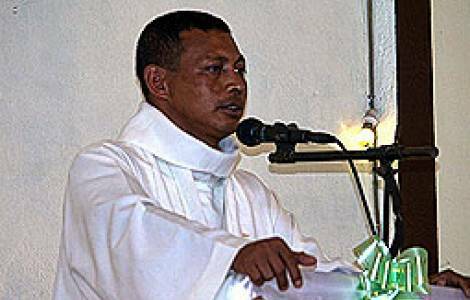 Odon Marie Arsène Razanakolona, Archbishop of Antananarivo, announced that he will file a complaint against the death of the priest who worked at the Soanavela formation center. According to Fr. Ludovic Rabenatoandro, Vicar General of the Archdiocese of Antananarivo, who reported the testimony given by Fr. Nicolas a few days before his death, on 9 February, around 6.30pm, while he was riding his motorcycle, he was stopped by some bandits on the road to Mahitsy, a rural town located only 30 km from the capital. Fr. Nicolas was returning to the Soanavela center, after bringing the Eucharist to a sick man. The criminals shot the priest behind his back. Once on the ground, they walked over him and kicked him. Before leaving, the bandits shot him for the second time. Mgr. Odon Razanakolona has indicted the inefficiencies and complicity of the police, saying that some policemen are in cahoots with criminals, to whom they rent their weapons. In the case of the ambush in which Fr. Nicolas was victim, the Archbishop emphasizes that the city's national gendarmerie did not respond to the request for assistance to the population, and arrived at the spot of the ambush with considerable delay. The population of Mahitsy had already complained about the lack of reactivity of the police forces during other attacks in the vicinity of their city. The Episcopal Commission "Justice and Peace" also urged the police to take measures to effectively combat the growing insecurity in the Country.